The Pre-Mother's Day Gift and Craft Show will be on Saturday, April 27th at Brown Chapel AME Church, 1400 Boyle Street, Pittsburgh, PA 15212 near AGH. The event starts at 9 am to 2 pm. 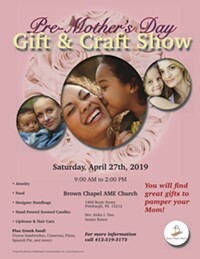 At the event, you will find jewelry, designer handbags, fashion, Avon, Handmade Greeting Cards, candles, soaps, pillows, Greek food and more! GREEK FOOD I am so excited that one of the vendor Nedal Kresat (Greek Food Nedal Gyro) will be selling Greek Food at the Pre-Mother's Day Gift and Craft Show event on Saturday, April 27th.